OHIO VALLEY — Holzer Hospice announced plans Friday for their annual bereavement camp for children who have suffered a loss. 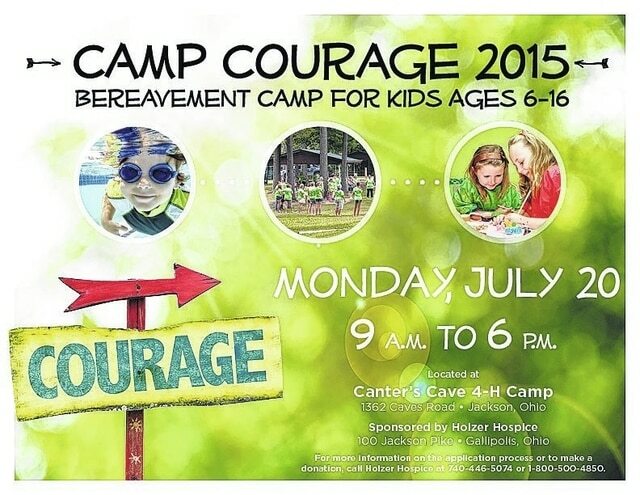 The one-day camp, titled “Camp Courage,” will be 9 a.m. to 6 p.m. July 20 at Canter’s Cave 4-H Camp in Jackson. The camp, at no cost to its participants, provides an environment where children ages 6 to 17 come together with other individuals who have experienced the loss a close family member, friend or pet. According to national statistics, childhood bereavement is far more common than many people realize. One in nine children experiences a loss before the age of 20 through divorce, death or other circumstances. The goal is to give children a place where they are free to express their feelings, camp officials said. The activities that are held during the camp generate thoughts and enhance discussion about what they are feeling in a non-threatening way. One of the things about grieving is finding new meaning in life without a loved one, Saunders said. A camp of this nature, she added, is beneficial to children and is fully funded through grant dollars and contributions from local business and community members. Volunteers are needed to facilitate the camp’s activities and supervision the children. Past volunteers have included registered nurses, social workers, chaplains, counselors and adult and teen volunteers. Holzer guidelines stipulate that volunteers be at least 18 years old or older. For more information about the camp, apply for a child to attend, to volunteer for the camp or to have a Hospice representative speak to an organization about the camp, call Hospice at 740-446-5074 or 1-800-500-4850.